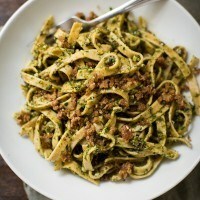 Olive Pesto Pasta | Naturally.Olive Pesto Pasta | Naturally. Prepare pasta according to directions. Drain, reserving some of the pasta water, and place pasta in a bowl or return to pot. While pasta is cooking, pulse the basil, parsley, and garlic in a food processor until minced. Add in the olives, tomes, lemon juice, olive oil, and almonds. Continue to until pesto is well combined. Add to pasta and toss, adding a splash or two of pasta water until the pasta is coated. In a dry skillet over medium heat, toast breadcrumbs until lightly browning. Sprinkle on top of pasta and serve. + I used sun-dried tomatoes packed in olive but you could also use non-oil packed sun-dried tomatoes but you might need to add a splash more olive oil or lemon juice.